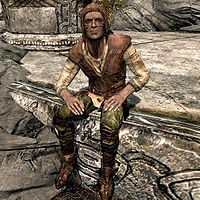 Cedran is the Breton hostler at Markarth Stables. He can sell you a black and white horse for 1000 septims. He wears farmer's clothes, boots, and a hat. He carries an iron dagger and a key to Markarth Stables. He wakes up in the stables at 8am, and gets to work at the stables right away. After working the stables for twelve hours straight, he'll head back inside, at 8pm. He'll then relax inside for four hours, before going to bed at midnight. When you greet him, he'll say, "You need a reliable horse in the Reach. That's what we have." After buying a black and white horse for 1000 gold, he'll tell you, "You treat a horse well, it'll take you to Oblivion and back." If his assistant, Banning, is dead, he'll say, "Poor Banning. Twice as much work here in the stables without him." If you ask him who's in charge of Markarth, he'll say, "That would be Jarl Igmund. Young for a ruler of a Hold, especially the Reach. Wasn't surprising he stayed loyal to the Empire. His father helped capture Ulfric Stormcloak after the Markarth incident." Or, if the Stormcloaks have taken over the hold, he'll spit "Since the Stormcloaks took over, Jarl Thongvor is in charge. It'll be lean times for the Reach with a Silver-Blood ruling it, that's for certain." If you ask him what the Markarth Incident was, he'll say, "It's the whole reason Ulfric revolted against the Empire. Well, the first reason anyway. Forsworn had taken over Markarth, and Ulfric and his men drove them out. Empire promised they'd be free to worship Talos afterwards. Pity no one told the Elves. Whole group of those Thalmor came and they demanded Ulfric's arrest." If you ask him who the Forsworn are, he'll say, "Before the Nords came, we worshipped the old gods, had our own kingdom. Times have been good and bad since then, but some folks couldn't handle not ruling their own land. Those are the Forsworn. The Forsworn follow the old ways, but some of those were best forgotten. Blood sacrifices, communing with Daedra. it's the road to ruin." When exiting conversation, he'll say, "May the crags fail to trip your feet." or "Safe travels to you." This page was last modified on 18 February 2018, at 14:58.